"Lord Amherst" redirects here. It may also refer to William Amherst, 1st Earl Amherst. Field Marshal Jeffery[n 1] Amherst, 1st Baron Amherst, KB (29 January 1717 – 3 August 1797) served as an officer in the British Army and as Commander-in-Chief of the Forces. Amherst is best known as the architect of Britain's successful campaign to conquer the territory of New France during the Seven Years' War. Under his command, British forces captured the cities of Louisbourg, Quebec City and Montreal, as well as several major fortresses. He was also the first British Governor General in the territories that eventually became Canada. Numerous places and streets are named for him, in both Canada and the United States. Amherst's legacy is controversial due to his expressed desire to exterminate the race of indigenous people during Pontiac's War, and his advocacy of biological warfare in the form of gifting blankets infected with smallpox as a weapon. This has led to a reconsideration of his legacy. In 2017, the City of Montreal removed his name from a street in the city. The city of Amherst, Nova Scotia is also considering renaming in light of recent movements to reconsider the naming of "towns, streets and monuments that celebrate past war heroes whom, seen through today's ethical lens are not people who behaved in ways that we respect today," as is the town of Amherstburg, Ontario. Born the son of Jeffrey Amherst (d. 1750), a Kentish lawyer, and Elizabeth Amherst (née Kerrill), Jeffery Amherst was born in Sevenoaks, England, on 29 January 1717. His brothers included Admiral John Amherst and Lieutenant General William Amherst. At an early age, he became a page to the Duke of Dorset. Amherst became an ensign in the Grenadier Guards in 1735. Amherst served in the War of the Austrian Succession becoming an aide to General John Ligonier and participating in the Battle of Dettingen in June 1743 and the Battle of Fontenoy in May 1745. Promoted to lieutenant colonel on 25 December 1745, he also saw action at the Battle of Rocoux in October 1746. He then became an aide to the Duke of Cumberland, the commander of the British forces, and saw further action at the Battle of Lauffeld in July 1747. In February 1756, Amherst was appointed commissar to the Hessian forces that had been assembled to defend Hanover as part of the Army of Observation: as it appeared likely a French invasion attempt against Britain itself was imminent, Amherst was ordered in April to arrange the transportation of thousands of the Germans to southern England to bolster Britain's defences. He was made colonel of the 15th Regiment of Foot on 12 June 1756. By 1757 as the immediate danger to Britain had passed the troops were moved back to Hanover to join a growing army under the Duke of Cumberland and Amherst fought with the Hessians under Cumberland's command at the Battle of Hastenbeck in July 1757: the Allied defeat there forced the army into a steady retreat northwards to Stade on the North Sea coast. Amherst was left dispirited by the retreat and by the Convention of Klosterzeven by which Hanover agreed to withdraw from the war: he began to prepare to disband the Hessian troops under his command, only to receive word that the Convention had been repudiated and the Allied force was being reformed. 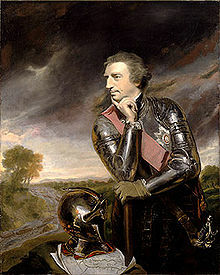 Amherst gained fame during the Seven Years' War, particularly in the North American campaign known in the United States as the French and Indian War when he led the British attack on Louisbourg on Cape Breton Island in June 1758. In the wake of this action, he was appointed commander-in-chief of the British army in North America and colonel-in-chief of the 60th (Royal American) Regiment in September 1758. Amherst then led an army against French troops on Lake Champlain, where he captured Fort Ticonderoga in July 1759, while another army under William Johnson took Niagara also in July 1759 and James Wolfe besieged and eventually captured Quebec with a third army in September 1759. Amherst served as the nominal Crown Governor of Virginia from 12 September 1759. From July 1760, Amherst led an army down the Saint Lawrence River from Fort Oswego, joined with Brigadier Murray from Quebec and Brigadier Haviland from Ile-aux-Noix in a three-way pincer, and captured Montreal, ending French rule in North America on 8 September. He infuriated the French commanders by refusing them the honours of war; the Chevalier de Lévis burned the colours rather than surrendering them, to highlight his differences with Vaudreuil for later political advantage back in France. The Lord hath done great things for us, whereof we are glad... Long had it been the common opinion, Delenda est Carthago, Canada must be conquered, or we could hope for no lasting quiet in these parts; and now, through the good hand of our God upon us, we see the happy day of its accomplishment. We behold His Majesty's victorious troops treading upon the high places of the enemy, their last fortress delivered up, and the whole country surrendered to the King of Britain in the person of his general, the intrepid, the serene, the successful Amherst. In recognition of this victory, Amherst was appointed Governor-General of British North America in September 1760 and promoted to major-general on 29 November 1760. He was appointed Knight of the Order of the Bath on 11 April 1761. From his base at New York, Amherst oversaw the dispatch of troops under Monckton and Haviland to take part in British expeditions in the West Indies that led to the British capture of Dominica in 1761 and Martinique and Cuba in 1762. The uprising of many Native American tribes in the Ohio Valley and Great Lakes region, commonly referred to as Pontiac's War after one of its most notable leaders, began in early 1763. Since 1753, when the French first invaded the territory, until February 1763, when peace was formally declared between the English and French, the Six Nations and tenant tribes always maintained that both the French and the British must remain east of the Allegheny Mountains. After the British failed to keep their word to withdraw from the Ohio and Allegheny valleys, a loose confederation of Native American tribes including the Delawares, the Shawnees, the Senecas, the Mingoes, the Mohicans, the Miamis, the Ottawas and the Wyandots, who were enraged with British post-war occupation of the region, banded together in an effort to drive the British out of their territory. "Could it not be contrived to send the small pox among the disaffected tribes of Indians? We must on this occasion use every stratagem in our power to reduce them." "P.S. I will try to inocculate [sic] the Indians by means of Blankets that may fall in their hands, taking care however not to get the disease myself. As it is pity to oppose good men against them, I wish we could make use of the Spaniard's Method, and hunt them with English Dogs. Supported by Rangers, and some Light Horse, who would I think effectively extirpate or remove that Vermine." "P.S. You will Do well to try to Innoculate [sic] the Indians by means of Blankets, as well as to try Every other method that can serve to Extirpate this Execrable Race. I should be very glad your Scheme for Hunting them Down by Dogs could take Effect, but England is at too great a Distance to think of that at present." Historians Elizabeth Fenn and Benedict Kiernan have shown, "Fort Pitt had anticipated these orders. Reporting on parleys with Delaware chiefs on June 24, a trader [William Trent] wrote: '[We] gave them two Blankets and an Handkerchief out of the Small Pox Hospital. I hope it will have the desired effect.' The military hospital records confirm that two blankets and handkerchiefs were 'taken from people in the Hospital to Convey the Smallpox to the Indians.' The fort commander paid for these items, which he certified 'were had for the uses above mentioned.' Historian Elizabeth Fenn has documented 'the eruption of epidemic smallpox' among Delaware and Shawnee Indians nearby, about the time the blankets were distributed." Amherst was summoned home, ostensibly so that he could be consulted on future military plans in North America, and was replaced pro tem as Commander-in-Chief, North America by Thomas Gage. Amherst expected to be praised for his conquest of Canada, however, once in London, he was instead asked to account for the recent Native American rebellion. He was forced to defend his conduct, and faced complaints made by William Johnson and George Croghan, who lobbied the Board of Trade for his removal and permanent replacement by Gage. He was also severely criticised by military subordinates on both sides of the Atlantic. Nevertheless, Amherst was promoted to lieutenant-general on 26 March 1765, and became colonel of the 3rd Regiment of Foot in November 1768. On 26 March 1767 Jeffrey Amherst married Elizabeth, daughter of General George Cary (portrait by Sir Joshua Reynolds, 1767). Jeffrey Amherst, 1st Baron Amherst, by Sir Joshua Reynolds. On 22 October 1772, Amherst was appointed Lieutenant-General of the Ordnance, and he soon gained the confidence of George III, who had initially hoped the position would go to a member of the Royal Family. On 6 November 1772, he became a member of the Privy Council. Amherst was raised to the peerage on 14 May 1776, as Baron Amherst, of Holmesdale in the County of Kent. On 24 March 1778 he was promoted to full general and, in April 1778, he became Commander-in-Chief of the Forces, which gave him a seat in the Cabinet. In 1778, when the British commander in North America, William Howe, requested to be relieved, Amherst was considered as a replacement by the government: however, his insistence that it would require 75,000 troops to fully defeat the rebellion was not acceptable to the government, and Henry Clinton was instead chosen to take over from Howe in America. Following the British setback at Saratoga, Amherst successfully argued for a limited war in North America, keeping footholds along the coast, defending Canada, East and West Florida, and the West Indies while putting more effort into the war at sea. On 7 November 1778 the King and Queen visited Amherst at his home, Montreal Park, in Kent and on 24 April 1779 he became colonel of the 2nd Troop of Horse Grenadier Guards. A long-standing plan of the French had been the concept of an invasion of Great Britain which they hoped would lead to a swift end to the war if it was successful: in 1779 Spain entered the war on the side of France, and the increasingly depleted state of British home forces made an invasion more appealing and Amherst organised Britain's land defences in anticipation of the invasion which never materialised. In June 1780, Amherst oversaw the British army as they suppressed the anti-Catholic Gordon Riots in London: after the outbreak of rioting Amherst deployed the small London garrison of Horse and Foot Guards as best as he could but was hindered by the reluctance of the civil magistrates to authorise decisive action against the rioters. Line troops and militia were brought in from surrounding counties, swelling the forces at Amherst's disposal to over 15,000 many of whom were quartered in tents in Hyde Park and a form of Martial Law was declared, giving the troops the authority to fire on crowds if the Riot Act had first been read; although order was eventually restored, Amherst was personally alarmed by the failure of the authorities to suppress the riots. In the wake of the Gordon Riots, Amherst was forced to resign as Commander-in-Chief in February 1782 and was replaced by Henry Conway. On 23 March 1782 he became captain and colonel of the 2nd Troop of Horse Guards. On 8 July 1788, he became colonel of the 2nd Regiment of Life Guards and on 30 August 1788 he was created Baron Amherst (this time with the territorial designation of Montreal in the County of Kent) with a special provision that would allow this title to pass to his nephew (as Amherst was childless, the Holmesdale title became extinct upon his death). With the advent of the French Revolutionary Wars, Amherst was recalled as Commander-in-Chief of the Forces in January 1793: however is generally criticised for allowing the armed forces to slide into acute decline, a direct cause of the failure of the early campaigns in the Low Countries: Pitt the Younger said of him "his age, and perhaps his natural temper, are little suited to the activity and the energy which the present moment calls for". Horace Walpole called him "that log of wood whose stupidity and incapacity are past belief". "He allowed innumerable abuses to grow up in the army… He kept his command, though almost in his dotage, with a tenacity that cannot be too much censured". He retired from that post in February 1795, to be replaced by the Duke of York, and was promoted to the rank of field marshal on 30 July 1796. He retired to his home at Montreal Park and died on 3 August 1797. He was buried in the Parish Church at Sevenoaks. In 1753 he married Jane Dalison (1723-1765). Following her death he married Elizabeth Cary (1740-1830), daughter of Lieutenant General George Cary (1712-1792), who later became Lady Amherst of Holmesdale, on 26 March 1767. There were no children by either marriage. Several places are named for him: Amherstburg, Ontario (location of General Amherst High School), Amherst, Massachusetts (location of the University of Massachusetts Amherst, Hampshire College and Amherst College), Amherst, New Hampshire, Amherst, Nova Scotia, Amherst, New York and Amherst County, Virginia. Amherst's desire to exterminate the indigenous people is now viewed as a dark stain on his legacy and various agencies, municipalities and institutions have reconsidered the use of the name "Amherst". "The Un-Canadians", a 2007 article in The Beaver, includes Amherst in a list of people in the history of Canada who are considered contemptible by the authors, because he "supported plans of distributing smallpox-infested blankets to First Nations people." In 2008, Mi'kmaq spiritual leader John Joe Sark called the name of Fort Amherst Park of Prince Edward Island a "terrible blotch on Canada", and said: "To have a place named after General Amherst would be like having a city in Jerusalem named after Adolf Hitler...it's disgusting." Sark raised his concerns again in a 29 January 2016 letter to the Canadian government. Mi'kmaq historian Daniel N. Paul, who referred to Amherst as motivated by white supremacist beliefs, also supports a name change, saying: "in the future I don't think there should ever be anything named after people who committed what can be described as crimes against humanity." In February 2016, a spokesperson for Parks Canada said it would review the matter after a proper complaint is filed; "Should there be a formal request from the public to change the name of the National Historic Site, Parks Canada would engage with the Historic Sites and Monuments Board of Canada for its recommendation." An online petition was launched by Sark to satisfy this formal request requirement on 20 February 2016. The park is known as Port-la-Joye–Fort Amherst National Historic Site and one of Parks Canada's partners for the site is the Mi'kmaq Confederacy of PEI. In 2009, Montreal City Councillor Nicolas Montmorency officially asked that Rue Amherst be renamed: "it is totally unacceptable that a man who made comments supporting the extermination of Native Americans to be honoured in this way". On 13 September 2017, the city of Montreal decided that the street bearing his name would be renamed. In 2016, Amherst College dropped its "Lord Jeffery" mascot at the instigation of the students. It also renamed the Lord Jeffery Inn, a campus hotel owned by the college, to the Inn on Boltwood in early 2019. ^ Lord Amherst spelled his name Jeffery, but Jeffrey and Geoffrey sometimes appear in sources discussing him. ^ a b c "Jeffrey Amherst and Smallpox Blankets". University of Massachusetts Amherst. Retrieved 29 August 2014. ^ Shingler, Benjamin (14 September 2017). "'Goodbye, Mr. Amherst': Why a decorated British general was stripped of his Montreal street". CBC. Retrieved 1 February 2018. ^ Pati, Anjuli (19 September 2017). "Town of Amherst wades into debate over controversial names". CBC. Retrieved 1 February 2018. ^ "What's in a name? Questions raised about Amherstburg namesake's history with Indigenous people". CBC News. 14 September 2017. Retrieved 1 February 2018. ^ a b c d e f "Jeffery Amherst, 1st Baron Amherst". Oxford Dictionary of National Biography. Retrieved 28 April 2012. ^ "Jeffrey Amherst". thepeerage.com. Retrieved 1 December 2010. ^ "No. 9590". The London Gazette. 8 June 1756. p. 2. ^ "No. 9930". The London Gazette. 11 September 1759. p. 1. ^ a b c Parkman, Francis: "Montcalm and Wolfe"
^ "No. 10056". The London Gazette. 25 November 1760. p. 11. ^ "No. 10094". The London Gazette. 7 April 1761. p. 2. ^ Krugler, John D. (1979). "Haviland, William". In Halpenny, Francess G (ed.). Dictionary of Canadian Biography. IV (1771–1800) (online ed.). University of Toronto Press. ^ Richard Middleton, Pontiac's War, Pgs. 1-128. ^ "No. 10507". The London Gazette. 23 March 1765. p. 1. ^ "No. 11294". The London Gazette. 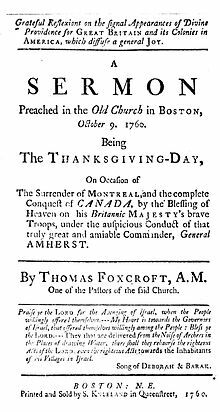 20 October 1772. p. 1. ^ "No. 11298". The London Gazette. 3 November 1772. p. 1. ^ "No. 11665". The London Gazette. 11 May 1776. p. 2. ^ "No. 11859". The London Gazette. 21 March 1788. p. 1. ^ "No. 11924". The London Gazette. 3 November 1778. p. 1. ^ "No. 11972". The London Gazette. 20 April 1779. p. 2. ^ "No. 12280". The London Gazette. 19 March 1782. p. 1. ^ "No. 13005". The London Gazette. 5 July 1788. p. 325. ^ "No. 13020". The London Gazette. 26 August 1788. p. 413. ^ "No. 13918". The London Gazette. 2 August 1796. p. 743. ^ Nunnerley, David. "A History of Montreal Park". Retrieved 22 April 2012. ^ "William Amherst letter to Jane Dalison Amherst, 1758". Retrieved 14 September 2017. ^ "George Cary". The Peerage.com. Retrieved 14 September 2017. ^ "A Brief History of the Town of Amherst" (PDF). Amherst Museum. 1997. Retrieved 23 April 2012. ^ "The Un-Canadians". Beaver, Vol. 87 Issue 4, p. 30. August – September 2007. Retrieved 8 August 2012. ^ "P.E.I. park honours general who wanted aboriginals killed, Mi'kmaq leader says". The Canadian Press. 8 February 2016. Archived from the original on 16 February 2016. Retrieved 9 February 2016. ^ Mensah-Bonsu, Deborah (16 August 2008). "Native leader says P.E.I. park needs name changed". CTV.ca. Archived from the original on 3 September 2014. Retrieved 23 June 2015. ^ "Parks Canada may consider renaming historic site Port-la-Joye–Fort Amherst". CBC.ca. 8 February 2016. Retrieved 9 February 2016. ^ "Le Devoir, Lundi 24 août 2009". Archived from the original on 27 August 2009. Retrieved 27 August 2009. ^ "Montreal adds Iroquois symbol to flag, strips British general of street name - Montreal - CBC News". Cbc.ca. Retrieved 14 September 2017. ^ Bidgood, Jess (26 January 2016). "Amherst College Drops 'Lord Jeff' as Mascot". New York Times. ^ "The Lord Jeffrey Inn Introduces New Name and Logo". Amherst College. 27 August 2018. Anderson, Fred (2001). Crucible of War: The Seven Years' War and the Fate of Empire in British North America, 1754–1766. London: Faber and Faber. ISBN 978-0-571-20565-3. Burne, Alfred (1949). The Noble Duke of York: The Military Life of Frederick Duke of York and Albany. Staples Press. Cappel, Constance (2007). The Smallpox Genocide of the Odawa Tribe at L'Arbre Croche, 1763: The History of a Native American People. Lewiston, NY: The Edwin Mellen Press. ISBN 0-7734-5220-6. Chartrand, René (2000). Louisbourg 1758: Wolfe's first siege. Oxford: Osprey. ISBN 978-1-84176-217-3. Farmer, John (1823). A gazetteer of the state of New Hampshire. Library of Congress. Hayes, Derek (2004). Canada: An Illustrated History. Douglas & McIntyre. ISBN 978-1-55365-046-1. Heim, Michael. Exploring America's Highways: Wisconsin Trip Trivia. T.O.N.E. Publishing. Hibbert, Christopher (1958). King Mob: The story of Lord George Gordon and the Riots of 1780. London: Longmans, Green & Co. ISBN 978-0-88029-399-0. Hibbert, Christopher (1990). Redcoats and Rebels: The American Revolution through British eyes. New York: Avon Books. ISBN 978-0-380-71544-2. Jacobson, Judy (2009). Detroit River Connections. Genealogical Publishing Co Inc. ISBN 978-0-8063-4510-9. Kiernan, Ben (2007). Blood and Soil. A World History of Genocide and Extermination from Sparta to Darfur, New Haven. Yale University Press. ISBN 978-0-300-10098-3. Long, J. C. (1933). Lord Jeffery Amherst: A Soldier of the King. New York: MacMillan. Mansel, Philip (1984). Pillars of Monarchy. Quartet. ISBN 978-0-7043-2424-4. Mayo, Lawrence Shaw (1916). Jeffrey Amherst: A Biography. Middleton, Richard, ed. (2003). Amherst and the conquest of Canada : selected papers from the correspondence of Major-General Jeffrey Amherst while Commander-in-Chief in North America from September 1758 to December 1760. Stroud: Sutton Publishing for the Army Records Society. ISBN 0-7509-3142-6. O'Toole, Fintan (2006). White Savage: William Johnson and the Invention of America. London: Faber and Faber. ISBN 978-0-571-21841-7. Patterson, Alfred Temple (1960). The Other Armada: The Franco-Spanish Attempt to Invade Britain in 1779. Manchester: University of Manchester Press. Smith, Margaret (2010). Virginia, 1492-1892. The British Library. Tucker, Spencer (2011). The Encyclopedia of North American Indian Wars, 1607–1890: A Political Social and Military History. ABC-CLIO Ltd. ISBN 978-1-85109-697-8. Wikimedia Commons has media related to Jeffery Amherst, 1st Baron Amherst. Jeffery Amherst papers, William L. Clements Library, University of Michigan. Stacey, C.P. (1979). "Amherst, Jeffrey". In Halpenny, Francess G (ed.). Dictionary of Canadian Biography. IV (1771–1800) (online ed.). University of Toronto Press. "Archival material relating to Jeffery Amherst, 1st Baron Amherst". UK National Archives. This page was last edited on 5 April 2019, at 04:26 (UTC).